FLORICAULA/LEAFY (FLO/LFY) plays an important role in the reproductive transition and controls flower spatial patterning by inducing the expression of the ABC floral organ identity genes. In this study, we sequenced two bacterial artificial chromosomes harboring a FLO/LFY and three other genes from yellow-poplar (Liriodendron tulipifera L.) and compared the gene order in this locus between several species. Besides the conserved terminal domains, key residues involved in interactions with DNA bases, backbone, and in dimerization were also conserved in the yellow-poplar FLO/LFY. Phylogenetic analysis of the FLO/LFY amino acid sequences placed yellow-poplar closer to eudicots than to monocotyledonous species. We found that gene content and order in this region of the yellow-poplar genome was more similar to corresponding regions in Vitis vinifera L., Carica papaya L., Populus trichocarpa Torr. & Gray, and Ricinus communis L., regardless of the evolutionary relationship. In addition, evidence for transposition, large insertions, and duplications were found, suggesting multiple and complex mechanisms of basal angiosperm genome evolution. The online version of this article (doi: 10.1007/s11295-010-0338-2) contains supplementary material, which is available to authorized users. The authors were grateful to James H. Leebens-Mack and Claude W. dePamphilis for providing the LtuLFY cDNA sequence and its 454 sequencing reads. 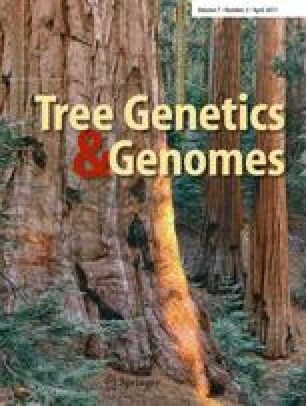 This study was supported by the Schatz Center for Tree Molecular Genetics at The Pennsylvania State University, the University of Tennessee Tree Improvement Program, and the National Institute of Food and Agriculture, USDA (under project number SC-1700324, technical contribution no. 5756 of the Clemson University Experiment Station).